Search cards are an essential to just about any card game – having the ability to reduce the slight randomness that comes with naturally drawing a card by searching out a specific one, thinning your deck out and improving the chances of getting another good card, and overall advancing your strategy is almost an essential part of the competitive aspect of the game! Imagine if you could just search out a face card while playing a poker game so you could get that full house or royal flush – it’d be way easier to win those kinds of games! So let’s add some random chance to our search card and see if it’ll be good. Order Pad is an Item card that searches Item cards…so long as you flip Heads on a coin toss. I don’t think the effect is anything new to the game – there have been coin flips on search effects in the past, so this is nothing new. It’s just an odd pick to have an Item search for…well, another Item. You’d almost think it’d be for a Supporter, or even on a Supporter like with Skyla in Expanded. There are some advantages to having this kind of effect on an Item though – you can activate multiples in a turn, unlike Supporters, and you can get an Item you need much more easily than you could normally. The thing about is, why wouldn’t you just max out on the Item you’re looking to run? Unless it’s an ACE SPEC card or if there’s a theoretical <Prism> Item card, you’re not really restricted to how many of an Item you can run. On top of that, it’s a 50/50 shot that you’ll even get the card off this effect, and I haven’t even touched on how this feeds into Garbodor! Order Pad is good for those decks that want to thin their deck out, maybe even run a few Items, but still have enough to be able to draw into them. At that point though, it’s honestly better to draw as many as you can or else have cards that are guaranteed to add stuff to your hand – preferable other Items or Supporters. In the meantime, Order Pad is just…not as good. Arora Notealus: It’s the little moments of adding in that randomness factor that can change a really good effect into a really mediocre one. 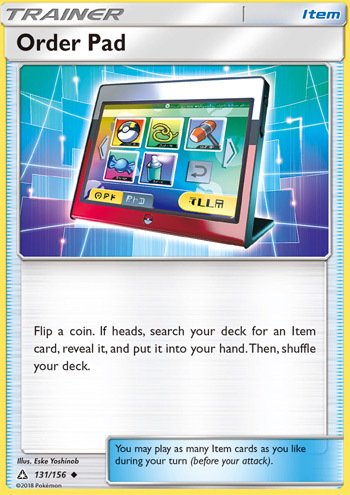 Order Pad has a good effect, but it’s a little irrelevant based on the deck it’s run in and the additional coin flip. Still though, if there aren’t any better alternatives in Standard, it’s not something you should knock off or keep yourself from running – but to be fair, there are cards like Cynthia hanging around. Side Reviews: Magearna – I don’t think I’ve seen Magearna too much in modern decks, but I can imagine in Expanded she’s getting usage in a lot of Mega Evolution decks. Having those Spirit Tools is great to avoid the negative aspect of Mega Evolving, but it takes up a valuable slot on your Pokemon! So having Magearna as a means of swapping them out is always nice to have by your side. Next Time: Time to go back in time for a bastion of defense! Order Pad looks innovating, like the ones where you see them at large restaurants. It’s designed to conveniently help you place orders without a server, and it has other apps to keep them busy outside of television, their own iPhone, or just plain chatting. While that saves both the server and the customers time to do anything else, you got to hope that your meal is coming because it would either come out or might got lost in the rubble of tens of pending orders. I think I’ve done enough of restaurant puns, but that’s what Order Pad is in a nutshell. If you flipped heads, you get an item card from your deck, waiting to be used almost right away; if you flipped tails, you get nothing. Either way, this easily fuels Trashalanche attack from Garbodor. This mean it is a item card that you should not heavily rely on because it can fail half the time. Instead, you treat this card like a bonus. If you can’t get one item card, then you have just thinned your hand by one, waiting to use Abyssal Hand or Shaymin-EX to draw more cards. Then again, if you find your experience with Order Pad pretty frustrating, then you can always leave that part behind. Order Pad (UP 131) was served up to us in the Ultra Prism expansion set. It’s been so long since that set came out that I had completely forgotten where I ranked it, and I couldn’t find my full ranking for this expansion, but I know it was pretty far down. I don’t even think I put it in the teens, I think it landed in the twenties. And, yes, it has taken its place among my more memorable predictions right up there with Sableye (GRI 80) and Dialga GX, except I was wrong the other way on this card. It is WAY better than I thought it would be. I’ve written about this recently, how I’m now teching Order Pads into as many of my Max Elixir decks as possible. The Palkia GX deck last Friday was a great example: I used Order Pads to help me get either Elixirs, Patches, or – my personal favorite – a Puzzle of Time when you’ve already got one in hand. Don’t get me wrong, this card is not as good as Trainer’s Mail was. If I’m not running Elixirs, I’m probably not running Order Pads. But if I am running Elixirs, you bet I’m running Order Pads and getting greedy as heck to try to get those Elixirs as fast as possible. And it worked well with Palkia, it’s worked well with Metalcrozma, heck I even got out old Evil Ball Yveltal EX itself and won a game with that this weekend abusing Max Elixirs as much as I could. And that’s the key: if you want to win in today’s meta, go get yourself some Max Elixirs and the biggest, baddest Basic Pokemon you can find. As I noted in the analysis of top decks I did a few weeks ago, the only Item card more likely to get you into the top 8 than Max Elixir was Enhanced Hammer. This month I am 20 W 10 L when I run decks with Max Elixirs (I’m 80 W 70 L overall). Order Pad will help you get those Elixirs that much faster. There’s no doubt in my mind that this card is in the top 10 if we re-rank all of the UP cards again. It definitely can help accelerate your offensive strategy. Like I said, it’s not for every deck, but if you haven’t tried it yet, I would highly recommend it in Elixir decks and probably even any deck that runs Puzzles as well.